In English 10, we are reading To Kill A Mockingbird by Harper Lee. There are many symbols and motifs shown in this book. Symbols are pictures or objects that stand for another thing. A motif is a design or a decorative pattern. The picture below is a Symbol/Motif wheel that my group and I did together, each of these are symbols that are in To Kill A Mockingbird. 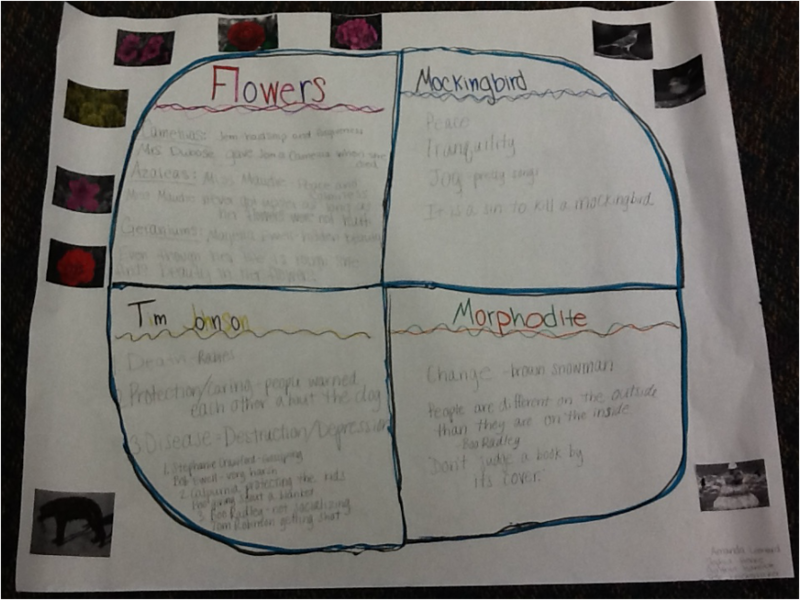 First, we have flowers, there are three different types of flowers present in the story. The flowers are motifs since they are mentioned multiple times. They are also symbols and have a specific meaning. Camellias stand for hardship and forgiveness because Jem helped Mrs. Dubose through a hard time. In return she gave him a camellia when she died. Next is azaleas, they are for peace and tranquility. The azaleas grew in Miss Maudie's yard and when ever she tended to them she was calm. The last flower is the geraniums, they can come in multiple colors and color variations. Geraniums are like the hidden beauty, they represent Mayella Ewell. Mayella is forced to do housework and is controlled by her abusive father. Many people do not see that she is a good person, this is like hidden beauty. Flowers can be great motifs and symbols as shown in this story. A morphodite is a change, these are shown through out this story. Jem changes from a boy to a young man when he becomes wise. Callpurnia says this to Scout after they talk to Jem. Another change in the story is the mud snowman. It is first made out of mud and the packed with snow, and resembles Mr. Avery. Someone notices and tells the children to make it different. The way blacks are treated has its own type of change, in the olden days colored's were slaves and during the story they were not. The coloreds could also go to trial unlike before, nowadays they have the same rights as any other person. There are many morphites in To Kill a Mockingbird. Tim Johnson is another symbol in this book. He is the dog that was infected with rabies, this could stand for death. All things must come to an end, and it might not be pleasant. It could also mean protection and caring because Callpurnia cared enough about others to warn them of the dog. Rabies is a disease, diseases cause destruction and can be depressing. Boo Radley is not a very social person and he could be unhappy or depressed. It is sad how Tim Johnson died but he was a main symbol in the story. Next is the mockingbird. The bird stands for peace, tranquility and joy. It causes joy by singing its pretty song, this is also why they are forbidden to be shot. It is declared a sin to shoot one or at least this is what Jem is told. The song puts people at peace when they hear it and it is meant to be special. One could compare Boo Radley to a mockingbird, they would see that Boo only wants the best for people and wants to protect them like he did to Scout and Gem when they were getting attacked. The mockingbird is a big part of this story and has substantial meaning. Motifs create sybomls by being repetitive like the flowers being repeated. When something is repeated it makes it stand out more to the reader, thus making it easier for them to notice it. If they notice it, it will be clearer what the symbol is. There are many motifs in this book, not just flowers, mockingbird, morphidites and Tiim Johnson.